Matthew De DECKERS (c. 1670 – c. 1718) was Alex’s 9th Great Grandfather; one of 1,024 in this generation of the Miller line. Matthew (Mattheus) De Deckers was born about 1670 in Amsterdam, Holland. His parents were Johannes De DECKERS and Margaret Van BELCAMP. He married Aefte (Eve) MESSECAR about 1687 in Staten Island, NY. Matthew died between 1715 and 1718 in Carles Neck, Fresh Kills, Staten Island, New York. Fresh Kills, Staten Island – In 1695 Matthew owned a farm at Carles Neck, Staten Island, New York, near the Freshkills. He had a cattle mark patented there on 13 April, 1704, and on 07 April, 1705 he owned a home, and lands near a road in Staten Island. 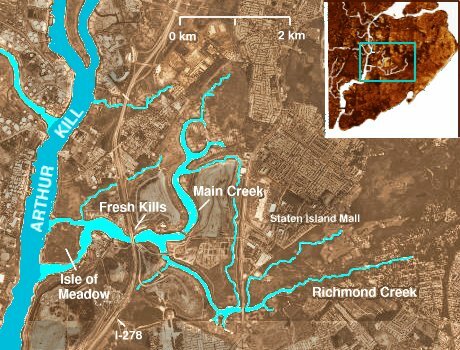 Fresh Kills (from the Middle Dutch word kille, meaning “riverbed” or “water channel”) is a stream and freshwater estuary in the western portion of the New York City borough of Staten Island. It is the site of the Fresh Kills Landfill, formerly New York City’s principal landfill. The watershed (basin) of the Fresh Kills drains much of the wet lowlands of the western portion of the island and flows into the Arthur Kill around the Isle of Meadows. Eve Messecar was born about 1671 in Staten Island, New York. Her parents were Johannes MESSCAR and Nealthe HARMENSE. Eve died after 19 May, 1718 when Lambert Garrison conveyed land to Eve Decker, the widow of Mattheus. There is some confusion as to where Matthew De Deckers was born; some historians state in New Amsterdam, others in Amsterdam, Holland, and still others at sea on one of the families many trips to Holland. In 1695 Matthew owned a farm at Carles Neck, Staten Island, New York, near the Freshkills. Calendar of N. Y. Colonial Manuscripts, indorsed Land Papers; in the Office of the Secretary of State of New York, 1 643-1 803.” It will be seen from a perusal of this volume that the land on Karle’s Neck and on Long Neck was in great demand in 1675 and later, and on one of the oldest maps, published in 1781, the words ” well settled” are placed across that portion of the Island. Long and Short Points. Parts of the irregularly shaped peninsula of meadowlying between Dock and Flowk Creeks on Karle’s Neck. Long Point is the farthest west. He had a cattle mark patented there on 13 April, 1704, and on 07 April, 1705 he owned a home, and lands near a road in Staten Island. He appears in the Staten Island census of 1706, and he was listed as a Cooper at this time. He was a member of the North Militia company in 1715, and was listed as 36 years old in the 1706 census. On 12 May, 1712 he conveyed land to John Depuy (probably the father-in-law of two of his children) at Carles Neck at the Freshkill, and on 19 May, 1718 Lambert Garrison conveyed land to Eve Decker, the widow of Mattheus. This land was comprised of 3 acres. On 13 April, 1704, Methuors Dacker “had his mark with three hapenies one each ear that is to say on each side of the ear one hapeney and one on the top of the ear and fo like wife one the other ear” (Richmond County Records p. 30). “Matthew De Decker, born about 1670 to Johannes De Decker and Margaret Belcamp and his many descendants formed an integral part of that area’s history. Around 1690, Matthew married Aefie or Eve _____, and they raised a large family on a farm at ‘Carles Neck’ near the Fresh Kill. Much is known about the Decker family, but the identity of Eve’s parents has remained a mystery. “While there are no known documents which prove Eve’s maiden name, it appears from a careful examination of existing records that she was the d/o Johannes Machgielzen Mesecar and Nealthe Harmense, residents of the county of Richmond (Staten Island) in the early 1700s. “Evidence to support the assumption that Eve was a Mesecar comes from early records of Kings and Richmond counties. 1. The ‘1706’ census of Staten Island shows two of Eve Decker’s older children were named in the traditional Dutch fashion after her parents, Johannes and Nealthe. 3. The most important proof of Eve’s identity can be found in the Port Richmond church records for 1718. Here Eve is listed as a sponsor for two of her grandchildren, once using her maiden name in the Dutch fashion, and once using her married name in the English tradition. Since records show no evidence of an unmarried Eve Decker living at this time, it seems safe to assume that Eve Messeker and Eve Decker are the same person, and that Eve was the daughter of Johannes Machgielzen Mesecar. allotted a plot of land in Gravesend and older brother, Adam, was a dealer in whale oil. Both brothers lived at Gravesend in 1687 when they took the Oath of Allegiance. “Johannes married Nealthe Harmense as evidenced by the baptismal record of their son, Machiel, at Flatbush on 23 November 1684. Several daughters and a son, Harmon (1682) were born prior to this time and probably spent their childhood in Gravesend. Pieter ‘s wife Susanna Hatfield was born Abt. 1693 in New York. i. Maria Decker, b. 21 Sep 1718 in Port Richmond Dutch Reformed Church. Witness to her baptism were Eduard JONES and Eva DEKKER. iii. Susanna Decker, b. 24 May 1724 in Port Richmond Dutch Reformed church, Staten Island. iv. Sara Decker, b. 23 Oct 1726 in Port Richmond Dutch Reformed church, Staten Island. v. Mattheus Decker, b. 28 Jun 1728 in Port Richmond Dutch Reformed church, Staten Island. vi. Eva Decker, b. 26 Mar 1732 in Port Richmond Dutch Reformed church, Staten Island. vii. Abraham Decker, b. 7 Apr 1735 in Port Richmond Dutch Reformed church, Staten Island. died 03 April 1813 at 78 years of age. Charles’ wife Magdalena (Lena) Sweem was born Abt. 1699 in New York. Charles’ will was dated 06 March, 1754 in Staten Island. i. Charles Decker, b. 18 Feb 1727/28 in Port Richmond Dutch Reformed church, Staten Island. He married Helena Sweem. ii. Matthys Decker, b. 5 Apr 1730 in Port Richmond Dutch Reformed church, Staten Island. iii. Magdalena Decker, b. 29 Oct 1732 in Port Richmond Dutch Reformed church, Staten Island. iv. Mattheus Decker, b. 16 Mar 1733/34 in Port Richmond Dutch Reformed church, Staten Island. v. Esther Decker, b. 8 Jan 1734/35 in Port Richmond Dutch Reformed church, Staten Island. vi. Eva Decker, b. 7 May 1741 in Port Richmond Dutch Reformed church, Staten Island. vii. Marya Decker 28 Jul 1751, Charlis Deckker, helena Sweem. Johannes’ wife Mary (Marytje or Maria) Sweem was born in Staten Island, New York. Her parents were Matthys Sweem and Sarah Praal. Johannes was listed in the Staten Island census in 1706. Witnesses, Peter Hausman, Aaron Dupuy, Barent Dupuy. Proved, December 27, 1779.
i. Maria Decker, b. 3 Jul 1726 in Port Richmond Dutch Reformed church, Staten Island. ii. Sara Decker, b. 21 Apr 1728 in Port Richmond Dutch Reformed church, Staten Island. iii. Matthys Decker, b. 24 May 1730 in Port Richmond Dutch Reformed church, Staten Island. May 24, 1730, Matthys, Johannes Dekker, Maria Sweem. Mai. 25, 1739, Eva, Joh: Dekkers, Marytje Sweem. Nealthe’s husband Nicholas DePuy was born aabout 1701 in New York. She was found in the 1706 Staten Island census, and she, and her husband attended the Port Richmond Dutch Reformed church. DePUY. At the revocation of the Edict of Nantes, there was a Protestant family of this name in Languedoc. Two brothers of this family, Philip and David, then fled to Holland, and became officers in the army of William of Orange ; they accompanied him to England, and were both killed at the battle of the Boyne. Another brother, Samuel, was an officer in the British army, and served in the Low Countries. But some of the name were in America before the revocation. In 1662, Nicolas du Pui, with his wife and three children, came to this country in the ship called the “Purmerland Church;” he probably settled on Staten Island, and was the progenitor of the family here, as we find his baptismal name perpetuated among them. If this assumption is correct, then the names of two of the three children were John and Francis, for we find them mentioned in the public records as early as 1681) ; John as defendant in a suit in March of that year, and Francis as owning a tract of woodland near Fresh kill, in December of that year. We do not meet with the name of Francis after that date, but find the name of John again, in the church record, as having a daughter Elizabeth baptized October 22, 1707, and a son Moses, July 22, 1714. Nicolas, perhaps a grandson of the original, and Neeltje (Cornelia) Dekker had the following children : A daughter, baptized April 6, 1724 ; and sons John, baptized June 27, 1725 ; Matthew, baptized October 8, 1726 ; Nicholas, baptized June 4, 1730; Moses, baptized October 27, 1732; Aaron, baptized August 26, 1739. Nicholas, last mentioned, was supervisor of Westfield in 1766. John, last mentioned, and his wife Sarah, had a son Nicholas, baptized in 1757. Moses, last mentioned, and his wife Leah, had the following children : John, born January 10, 1759 ; Nicholas, born June 3, 1766 ; Moses, born January 17, 1769. Barent, who probably was another son of Nicolas and Neeltje, and his wife Elsie Poillon, had the following children : Martha, baptized May 20, 1750, and Elsie, baptized December 9, 1739.
i. Catharina Depuy, b. 6 Apr 1724 in Port Richmond Dutch Reformed Church. Witness to her baptism were Eduard Jones, and Catharina Dekkers. iii. Mattheus Depuy, b. 9 Oct 1726 in Port Richmond Dutch Reformed church, Staten Island. iv. Nicolas Depuy, b. 4 Jan 1730/31 in Port Richmond Dutch Reformed church, Staten Island. vi. Aaron Depuy, b. 26 Aug 1739 in Port Richmond Dutch Reformed church, Staten Island. Zegar’s first wife Elizabeth Depuy was born Abt. 1712 in Staten Island, New York. Zegar’s second wife Susannah Jones was born Abt. 1716 in Staten island, New York. Her parents were Edward JONES and Catharine DECKER. Susannah was a witness to a baptism on 07 April, 1735 in the Port Richmond DRC of Pieter Decker and Susanna Hatfield’s son Abraham. She was a witness to the baptism of Johannes Decker, son of Johannes Decker, and Nence Merrel in the Port Richmond DRC on 19 April, 1743. Zegar was a witness to the baptism of Edward JONES and Catherine DECKER’s son Edward Jones, born 14 Aug 1726 in Port Richmond Dutch Reformed Church. i. Eva Decker, b. 5 Apr 1730 in Port Richmond Dutch Reformed church, Staten Island. Matthew’s wife Aaltje Merrill was born April 01, 1718 in Port Richmond, Staten Island, New York. Her parents were Richard Merrill and Aaltje Dorlandt. Aaltje died Abt. 1765 in Staten Island, New York. This entry was posted in 11th Generation, Immigrant - Continent, Line - Miller, Veteran and tagged Staten Island Pioneer. Bookmark the permalink. Zgadzam si� z Tob�, to ciekawe co piszesz. Przez d�ugi czas poszukiwa�em porz�dnej strony na ten temat i w ko�cu znalaz�em. B�d� zagl�da� bardziej regularnie. Tak trzyma�.